The Great California Flood of 1861-1862 was a series of four floods from December 9, 1861, Dec. 23-28, January 9-12, 1862 and January 15-17. The winter rains started early in November and continued nearly interrupted for four months. Marysville and Sacramento suffered the worst damage in the Northern California valley. 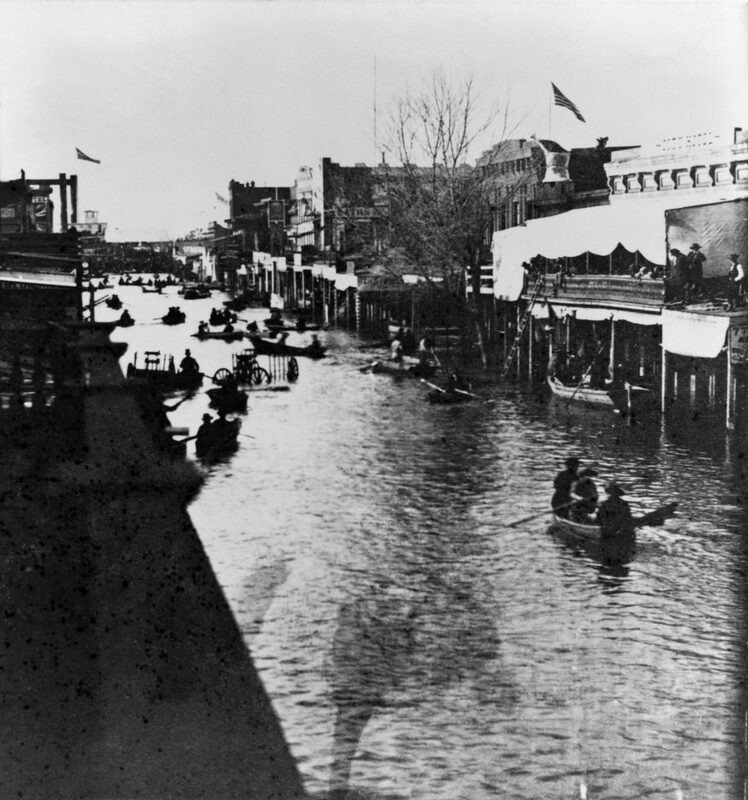 This scene shows the floodwaters along K Street looking west from 4th Street in Sacramento, Calif. Photo taken January 1862. Keith Porter et al., Overview of the ARkStorm scenario (2011). I Sue Wing, A Rose & A Wein, Economic impacts of the ARkStorm scenario, Overview of the ARkStorm Scenario 2010–1312 (2010). The U.S. Geological Survey, Multi Hazards Demonstration Project (MHDP) uses hazards science to improve resiliency of communities to natural disasters including earthquakes, tsunamis, wildfires, landslides, floods and coastal erosion. The project engages emergency planners, businesses, universities, government agencies, and others in preparing for major natural disasters. The project also helps to set research goals and provides decision-making information for loss reduction and improved resiliency. The first public product of the MHDP was the ShakeOut Earthquake Scenario published in May 2008. This detailed depiction of a hypothetical magnitude 7.8 earthquake on the San Andreas Fault in southern California served as the centerpiece of the largest earthquake drill in United States history, involving over 5,000 emergency responders and the participation of over 5.5 million citizens. This document summarizes the next major public project for MHDP, a winter storm scenario called ARkStorm (for Atmospheric River 1,000). Experts have designed a large, scientifically realistic meteorological event followed by an examination of the secondary hazards (for example, landslides and flooding), physical damages to the built environment, and social and economic consequences. The hypothetical storm depicted here would strike the U.S. West Coast and be similar to the intense California winter storms of 1861 and 1862 that left the central valley of California impassible. The storm is estimated to produce precipitation that in many places exceeds levels only experienced on average once every 500 to 1,000 years. Extensive flooding results. In many cases flooding overwhelms the state’s flood-protection system, which is typically designed to resist 100- to 200-year runoffs. The Central Valley experiences hypothetical flooding 300 miles long and 20 or more miles wide. Serious flooding also occurs in Orange County, Los Angeles County, San Diego, the San Francisco Bay area, and other coastal communities. Windspeeds in some places reach 125 miles per hour, hurricane-force winds. Across wider areas of the state, winds reach 60 miles per hour. Hundreds of landslides damage roads, highways, and homes. Property damage exceeds $300 billion, most from flooding. Demand surge (an increase in labor rates and other repair costs after major natural disasters) could increase property losses by 20 percent. Agricultural losses and other costs to repair lifelines, dewater (drain) flooded islands, and repair damage from landslides, brings the total direct property loss to nearly $400 billion, of which $20 to $30 billion would be recoverable through public and commercial insurance. Power, water, sewer, and other lifelines experience damage that takes weeks or months to restore. Flooding evacuation could involve 1.5 million residents in the inland region and delta counties. Business interruption costs reach $325 billion in addition to the $400 billion property repair costs, meaning that an ARkStorm could cost on the order of $725 billion, which is nearly 3 times the loss deemed to be realistic by the ShakeOut authors for a severe southern California earthquake, an event with roughly the same annual occurrence probability. The ARkStorm has several public policy implications: (1) An ARkStorm raises serious questions about the ability of existing federal, state, and local disaster planning to handle a disaster of this magnitude. (2) A core policy issue raised is whether to pay now to mitigate, or pay a lot more later for recovery. (3) Innovative financing solutions are likely to be needed to avoid fiscal crisis and adequately fund response and recovery costs from a similar, real, disaster. (4) Responders and government managers at all levels could be encouraged to conduct risk assessments, and devise the full spectrum of exercises, to exercise ability of their plans to address a similar event. (5) ARkStorm can be a reference point for application of Federal Emergency Management Agency (FEMA) and California Emergency Management Agency guidance connecting federal, state and local natural hazards mapping and mitigation planning under the National Flood Insurance Plan and Disaster Mitigation Act of 2000. (6) Common messages to educate the public about the risk of such an extreme disaster as the ARkStorm scenario could be developed and consistently communicated to facilitate policy formulation and transformation. These impacts were estimated by a team of 117 scientists, engineers, public-policy experts, insurance experts, and employees of the affected lifelines. In many aspects the ARkStorm produced new science, such as the model of coastal inundation. The products of the ARkStorm are intended for use by emergency planners, utility operators, policymakers, and others to inform preparedness plans and to enhance resiliency. This report is available only on the Web. ← What would happen if the Mississippi River changed its course to the Atchafalaya?